Joints are the anatomical structures in which two bones are joined together by ligaments. The joints are lined with cartilage, which is a slippery, smooth surface that allows motion. Arthritis is defined as inflammation of a joint and results in the loss of your cartilage over time, resulting in stiffness, pain and swelling in the joint. Arthritis is caused by injury, abnormal motion, deformity, certain diseases or simply wear and tear over time, and if your individual case is severe or not responding to conservative treatment, your podiatrist may recommend a total ankle joint replacement to relive your pain. Considering there are 33 joints in the foot and all of them are susceptible to developing arthritis, foot and ankle arthritis is a common problem in the aging population. Conservative treatment for foot and ankle arthritis consists of anti-inflammatory medication or bracing. When this fails and ankle joint pain persusts, surgical options include fusion or joint replacement, which includes implant arthroplasty or interpositional arthroplasty. Replacing a painful ankle joint is preferable in many cases as it preserves motion, however there are specific criteria that must be met in order for joint replacement to be considered. Severe cases of ankle arthritis that are not responding to conservative treatment methods may benefit from total ankle replacement surgery, an effective procedure to treat pain and stiffness. This is the oldest and simplest form of joint replacement. This procedure involves the surgical removal of an arthritic joint and replacing it with a “spacer”, thereby restoring some motion and relieving pain. Many materials have been used to accomplish these goals including the patients own fat, muscle or tendon tissue, cadaver or bioengineered tissue or biocompatible materials, such as ceramic or metal balls or silicone spacers. Recovery time for this procedure is typically minimal and the success rate is high. The midfoot is especially amicable to this type of procedure. Ankle replacement surgery, also called total ankle arthroplasty (TAR), has greatly improved over the past 10 years, making it a quickly growing, highly successful solution for people who suffer from ankle pain and stiffness. Technological advancements in both the implant design and materials, as well as the instrumentation used to perform the procedure, have led to much better success rates and wider acceptance throughout the industry. The procedure is performed by making an incision in front of the ankle, removing the arthritic bone and cartilage and inserting the implant. A state-of-the-art, custom made, patient specific cutting block guides the surgeon in making precise cuts in the bone, allowing for more anatomically-fitting implants. Post-operative care typically consists of four to six weeks of no weight on the new ankle, followed by physical therapy. The result is usually less pain and more motion, allowing the patient to return to more normal activity. Joint replacement is a viable option for many patients with foot and ankle arthritis. These procedures are greatly improving lives and enabling previously pain-ridden patients to easily walk, run and enjoy activities with less pain, discomfort or the need for bracing or medications. 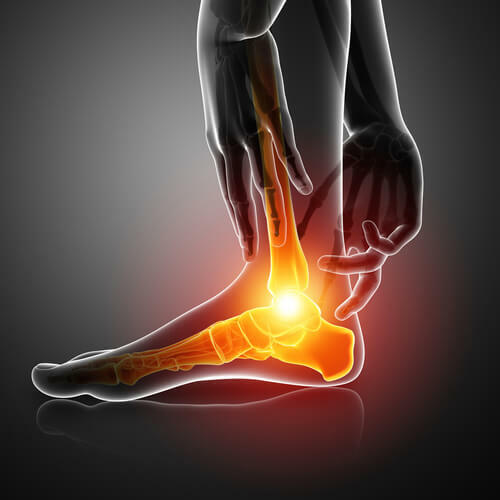 Therefore, anyone who suffers with painful feet or ankles should be evaluated by one of the board-certified podiatrists or surgeons at Certified Foot and Ankle Specialist with hopes that they might qualify for such a procedure.